Taking full advantage of the technical wizardry of modern filmmaking, writer-director George Lucas has conceived of his film, "STAR WARS," as an expression of his boyhood fantasy life - his love for "Flash Gordon" and all the great mysteries and adventures in books and movies. "STAR WARS" is a distillation of the joys Lucas experienced in the hours he spent watching television and movies, and reading comic books and comic strips. 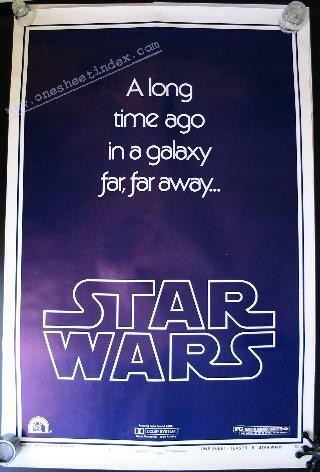 "STAR WARS," produced by Gary Kurtz, stars Alec Guinness, Mark Hamill, Harrison Ford, Carrie Fisher and Peter Cushing. It is released by 20th Century-Fox. It's a high-energy action movie uniting the hardware of contemporary space adventure with the romantic fantasies of sword and sorcery, plus a dash of wish fulfillment. Lucas' goal has been to make an imaginative entertainment experience that would transport audiences out of the theatre and into an unknown galaxy thousands of light years from earth. "STAR WARS" is a tale of heroes and villains and a romance between a young naive boy and a beautiful, spirited princess. It is an odyssey from innocence to knowledge, the ages-old tale of the passage of the sword from one generation to the next. It is a world where magic is possible, and love and goodness triumph over evil. "STAR WARS" follows a young man, Luke Skywalker, through exotic worlds uniquely different from our own. Leaving the small arid planet of Tatooine, Luke plunges into an extraordinary intergalactic search for the kidnapped Rebel Princess Leia from the planet Alderaan. Luke is joined in this adventure by Ben Kenobi, the last of the Jedi Knights who were the guardians of peace and justice in the old days before the "dark times" came to the galaxy; Han Solo, the dashing, cynical captain of the Millenium Falcon, a Corellian pirate starship; Chewbacca, a Wookiee, a race of tall anthropoids with quasi-monkey faces and large blue eyes; and the robots, See-Threepio (C3PO) and Artoo-Detoo (R2D2). This odd band of adventurers battle Grand Moff Tarkin, the evil Governor of the Imperial Outland regions, and Darth Vader, the malevolent Dark Lord of the Sith, who employs his extrasensory powers to aid Governor Tarkin in the destruction of the rebellion against the Galactic Empire. In the battle of Yavin, Luke engages in a terrifying climactic space battle over the huge man-made planet destroyer, Death Star. "STAR WARS" is a space fantasy designed to stimulate imaginations, entertain and give moviegoers an infinite variety of vicarious emotional, physical and mystical delights. It is a world people on this earth have never been to, but it's a world they may have encountered when years ago they dreamed about running away and having adventures that no one else had ever had. The 20th Century-Fox release, opened in May of 1977. Director of Photography .......................... GILBERT TAYLOR, B.S.C.